Stretch marks affect men and women of all ages and races. Between 75 and 90 percent of pregnant women develop them during their third trimester. Stretch marks also strike in 70 percent of adolescent females and 40 percent of adolescent males due to growth spurts during. With so many people experiencing this condition we would hope there would be a promising solution. Well microneedling to treat stretch marks has shown promising results. Our skin is elastic and has the ability to stretch out and return to its natural elasticity and form. Stretch marks appear on areas of the body where the skin is stretched beyond its natural capacity. Look at it like a rubber band that you keep stretching till it snaps. Also as we age the skins ability to rebound is diminished. Does that Mean there is No Hope for People with Stretch Marks? Actually, there is. Microneedling can significantly improve the appearance of stretch marks. Microneedle therapy, or collagen induction therapy, improves the color and texture of stretch marks, and makes the scars blend with the surrounding skin. A quality microneedling pen, like the MD Needle Pen, also reduces the width and indentation of stretch marks, and encourages the growth of tiny inlets of normal skin. So, while no method currently exists to repair stretch marks, a microneedle therapy system lightens their appearance, to the point of making them almost invisible. In the picture below, there is a considerable improvement in the prevalence and color of stretch marks. The scars have lightened to a great extent and are not obvious at first glance. What is Involved in Microneedling for Stretch Marks? A microneedling pen, like MD Needle Pen, is used to create microscopic injuries in the stretch marks and the body responds by producing new collagen at the wound sites. This natural reaction by the body heals the tears in the dermis responsible for the stretch marks. As the outer layer of the skin is not affected by micro needling, the new collagen generated is used only to help heal the stretch marks. Stretch marks require a series of microneedling sessions, usually at 4-6 week intervals. Here is an example of how the crater-like texture of stretch marks has smoothed out and blended with the surrounding skin. How Safe is Microneedling for Stretch Marks? 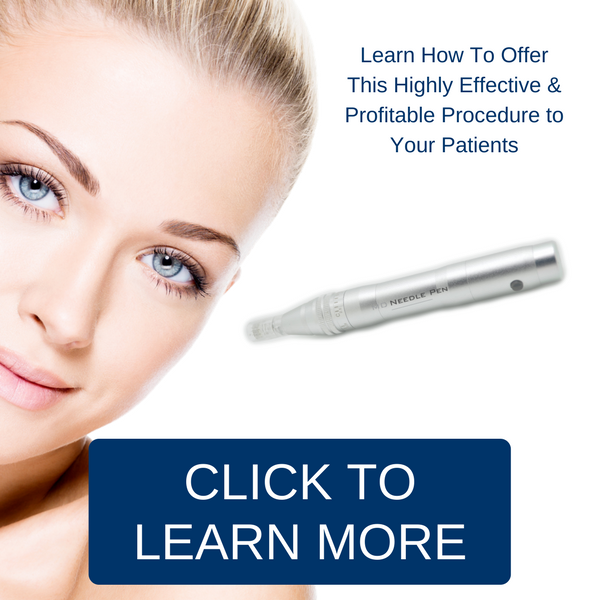 Microneedling is a chemical-free procedure suitable for all skin types and colors. As there is no risk of burning the patient and causing hyperpigmentation it is preferred over laser treatment.